Warning Crafters this is not card or project related! by posting this on my blog for my family and I to look back on someday! that don’t see us either in person or on Facebook! The corresponding numbers you see or shall I say don’t see, in this photo collage accompany the letter. It will make more sense when you read it. Basically every time I say Thankful in the letter I put a corresponding photo to go along with it. We hope this letter finds you well and you are finding sometime to enjoy life as you get ready for the Holiday Season! The Leppeks have had a relatively busy time this year starting January off with the Hall of Fame Bowl in Tampa, to root on Michigan! It was a very exciting game despite the loss, and we were (3)Thankful we were together to experience it. Ty is a Junior now at FSU despite the college thinking he is ready to graduate with the amount of hours he has already taken (117). He is also President of FSU’s Ballroom Club and is (7)Thankful he has the chance to teach his generation some of the dances of the past. Ty also had a paid internship this Summer in Sarasota, so we were beyond thrilled that he was home with us. He was working 50+ hours for a home automation company while still managing to take classes online. They loved him so much that they offered him a job and he currently works for them remotely while attending FSU. He was given the position of associate product manager for UX and UI, a field he hopes to pursue post grad. He is in charge of their app design for iPhone, iPad, and Android devices. The company also paid for him to attend and work the Largest Home Automation Conference in the U.S. in Denver, Colorado in September. He was in his glory to say the least. Talking to people about technology is what he does best! In case you haven’t noticed he has switched educational gears and is pursuing a more lucrative and stable career, besides that of a music teacher. His passion for Music is still burning strong, and I do believe it is what he was suppose to do with his life, however, he is equally or maybe even more gifted with technology and is enthusiastic about it as well. In his spare time, which is about Zero, he is writing a Young Adult Children’s book, and with the encouragement of his 8th grade English teacher he is determined to publish it someday! Ty also had his first set of stitches in his hand this year, it was moving day at FSU and my Birthday, and his mom told him to hurry it up, (Yes, Guilty) and needless to say the detour to the Hospital slowed things down quite a bit. So 7 stitches later, accompanied by a Birthday lunch at the local Chic-Fil-A, we were just (8,9) Thankful it wasn’t worse. With Tyler being home this summer we took it as a sign and opportunity to take a Family Vacation to NYC, a dream of ours for quite sometime; being the Theatre enthusiast that we are. We packed as much as we possibly could into those 5 days and enjoyed every moment of it. The weather was perfect! We managed to take in 2 shows; Newsies and First Date. We also, had our photos taken with the famous actors who stared in First Date…Zac Levi and Krista Rodriguez. It was a night we won’t soon forget. Between Central Park, Rockfeller Plaza, and the Empire State Building, just to name a few, I think one of the most moving moments was visiting the Twin Towers Memorial, it is something I will truly never forget. So (2)Thankful for memories like those! Dave has become quite a craftsmen this year and has started a side business called: carveymyart@aol.com. As you can see in the photo, and the front of the Christmas card, he is very talented. It all starts with a piece of Pine and turns into a work of ART! He is having difficulty keeping up with the demand and his ideas are plentiful. People keep telling us we need to take this idea to the TV show Shark Tank! We don’t know about that, however I am (4,5) thankful he is enjoying his craft as much as I enjoy mine. He spends a great deal of time in his shed and he sure keeps him out of trouble that way. Finally, my dad is doing well at the age of 83 I am (6)Thankful for everyday we get to spend with that wonderful man and that he continues to be in good health. Both the photo of my two men, and the photo of Dave, Dad and Ty were taken this Thanksgiving. So I leave you with my final statement that I am continuously (1)Thankful for memories like these. May your Holidays be joyful! You have blessed me this year more then you will ever know! I can’t wait to see where 2014 takes me on this wonderful journey! 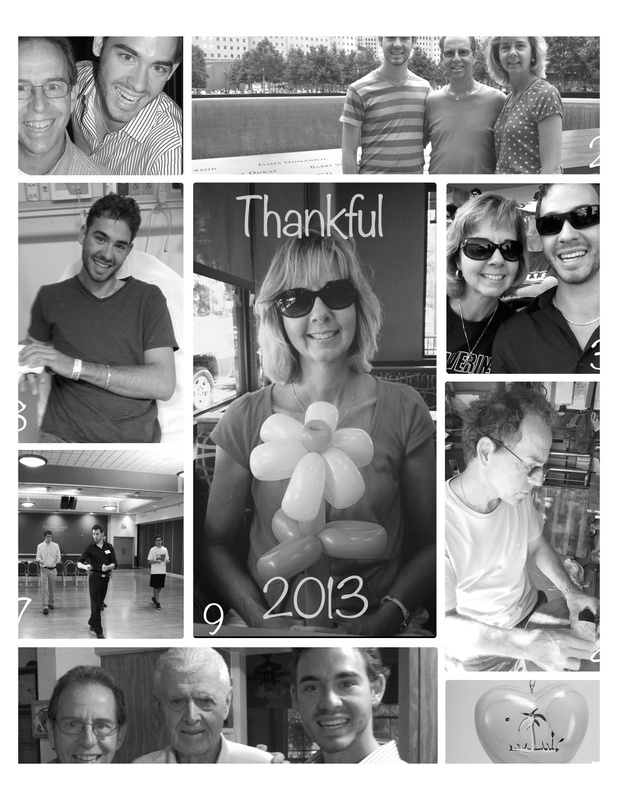 Categories: Other | Tags: Christmas letter, Family, photo collage, Reflection | Permalink. It sounds like you have a very talented family. Happy New Year to all of you! Wow, I so enjoyed reading your Christmas letter and seeing the photos. You definitely have a lot to be thankful for. I have been blessed by working with you on the Seize the Birthday design team and look forward to meeting you in person in 2014. Have a Blessed New Year. A very Happy New Year to you and your family from another Bradenton dweller. By the way, I loved your Time in a Bottle card. Awesome Kathleen! Thanks for your kind words! I will email you when life slows down! Happy, Happy New Year my friend…..be well! I just LOVED reading this post, Nancy! Your family is truly Blessed!